The Georgia Osteopathic Medical Association (GOMA) is a non-profit organization comprised of osteopathic physicians, residents, interns and students who meet the membership requirements of GOMA Constitution and Bylaws. GOMA strives to elevate and maintain the high standards of the profession by providing quality educational programs for its members and supporting osteopathic medical training programs. Adherence to an established Code of Ethics is strongly recommended. The state association offers to its members, through a doctor-to-doctor peer review program, an opportunity to address issues of an ethical nature. GOMA seeks to provide for the needs of its members by continually updating membership services especially in the area of medical education and information and government relations through the quarterly newsletter, the GEORGIA DO. Encouraging D.O.s in other states to locate their practices in Georgia is an ongoing effort. D.O. is the abbreviation for Doctor of Osteopathic Medicine. 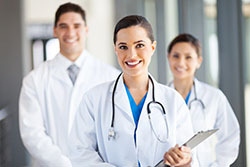 Commonly known as Osteopathic Physicians, D.O.s practice a "whole person" approach to medicine. Instead of just treating specific symptoms, osteopathic physicians concentrate on treating the whole patient. They focus on preventive health care and believe that the body is self-repairing, self-sustaining and self-adjusting and that it is the physician's job to help the body heal itself.